It started with a simple idea, born in the heartland of America. It was the latter part of the 19th century and the industrial age had reached all the way to farmers’ fields in the middle of Iowa. With the need to harvest countless acres of wheat, farmers used steam-powered harvesters to accomplish the job in less time and with fewer laborers. But when these giant machines broke down, the farmer might have to wait days for even the simplest repairs. One of the parts that had the most wear and tear on the harvesters was the chain belt drive. When one section of the belt wore out or broke, the entire chain had to be replaced or taken back to a metal shop for lengthy repair. One young entrepreneur in Belle Plaine, Iowa, found an alternative. William Dana Ewart, a farm implement dealer, proposed that a drive chain could be constructed of several detachable links. When wear and tear caused one piece or link to break, the defective section of the chain could easily be replaced right in the field, thus eliminating costly downtime for the farmers. Ewart called his new product the Link-Belt, and so our brand name and reputation for providing solutions to real workplace problems was born. Ewart patented his Link-Belt chain in 1874 and founded the Ewart Manufacturing Co. In 1880, Ewart founded the Link-Belt Machinery Co. and in 1888, the Link-Belt Engineering Co. Around 1890 these companies introduced the ancestor of modern Link-Belt construction equipment, the first wide-gauge, steam-powered coal handling clamshell crane. They continued to use the Link-Belt design as a foundation for all types of power transmission machinery, conveyors, coal handling machinery, crushers, screens and driers. 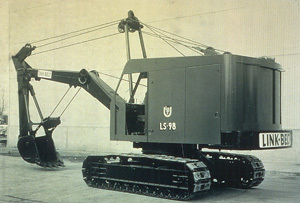 In 1906 the Link-Belt Company was formed in Chicago, Ill., consolidating the Ewart Manufacturing Co., the Link-Belt Machinery Co., and the Link-Belt Engineering Co.
By 1922, Link-Belt Co., had introduced a line of crawler mounted crane-shovels, forerunners of modern excavators, to complement its line of locomotive cranes and material handling equipment. This product line grew and by the late 1930s included a complete line of models ranging from 3/4 yard to 2-1/2 yard capacity. 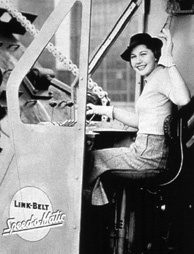 In 1939, Link-Belt Co. purchased the Speeder Machinery Corporation, a company that also had a solid reputation in the marketplace as a crane-shovel manufacturer in the 3/8 yard to 3/4 yard capacity range. Speeder had introduced the first wheel mounted excavator, the Tumblebug, in 1922. Link-Belt’s Crane and Shovel Division merged with Speeder Machinery to form the Link-Belt Speeder Corporation, a wholly owned subsidiary of Link-Belt Co., eventually locating in Cedar Rapids, Iowa. This consolidation gave the new corporation a complete line of machines with centralized manufacturing, sales and engineering that yielded substantial growth and profitability for the next 30 years. Link-Belt Speeder introduced many design innovations during this period. In 1949, the revolutionary full-function design was introduced and in combination with the Speed-O-Matic power controls established Link-Belt Speeder as a world leader in cranes and excavators. These design originals culminated in the Flagship Model, LS-98 excavator which was manufactured well into the late 20th century. In 1967, the FMC Corporation purchased the Link-Belt Company. The subsidiary, Link-Belt Speeder, was spun-off and became the Construction Equipment Group, a division of FMC Corporation, marketing Link-Belt construction equipment products worldwide. Shortly thereafter, FMC began an aggressive, long term capital expansion plan that saw the facilities and product line rapidly diversify with the introduction of hydraulic excavators in 1967 and other new crane products through 1978. In 1986, because of changing world economics, the Link-Belt Construction Equipment Co. was formed as a joint venture between FMC Corporation and Sumitomo Heavy Industries. This formalized a partnership dating back to 1962, when Link-Belt Speeder first signed a licensing agreement with Sumitomo Heavy Industries to manufacture cranes. Finally, in 1998, the excavator division of Link-Belt Construction Equipment Co. formed a new company, LBX Company LLC. LBX Company, headquartered in Lexington, Ky., became the sole manufacturer and marketer of Link-Belt excavators, forestry and material handling equipment and began to focus all their design efforts on new technologies to meet the needs of today’s customers. Seeing that its core customers needed a variety of earthmoving equipment, LBX Company made the move to offer an expanded product line when they introduced the highly innovative LX Series excavators. Then in 2002, LBX added the minimum swing radius Spin Ace excavators to the product line. In July of 2006 LBX constructed their new World Headquarters which hosts their corporate offices, an engineering facility for both development and testing of new products, a Sales and Service training center, service bays and a demonstration work site. Then in 2007, LBX erected a 50,000 square foot state of the art Parts Depot, located on the same campus as the corporate offices. The synergies of having everything located on one campus allows LBX to offer world class support and service to our dealer network and their customers. In 2007, LBX introduced the X2 series of excavators still sold in many parts of the world today and proof that LBX is always innovating to provide the best choice for contractors in the industry. ExtremeTechnology has resulted in significant improvements in the areas of power, profitability, efficiency, productivity, durability, serviceability and comfort. Continuing our tradition of innovation, in 2011 LBX unveiled the new Interim Tier-4 compliant X3 product line featuring up to 10% better fuel efficiency, more lift capacity and better overall safety features. Early 2012 marked the establishment of LBX do Brasil to meet the fast pace growth of Brazil’s booming construction demands. With LBX do Brasil’s offices, training facilities and parts depot located in Sorocaba, Sao Paulo, Brazil, LBX do Brasil offers the same world class support and service to our dealer network and customers in Brazil. In November of 2014, LBX introduced the X4 series of hydraulic excavators. This Final Tier 4 compliant machine features an increased lift capacity, faster cycle times and better fuel economy. Link-Belt excavators can be found working in a variety of applications, including excavating, forestry, demolition and scrap/material handling. For more information about our products, contact your local dealer.